NEW 2017 BOOK CATALOG IS OUT! From a posting on Diane's website, insights on the Ascension as we all move into higher realms of Light and are experiencing vivid dreams, synchronicities and physical fatigue. "Taken aboard" and "Conspiracy theory or actual?" "The Myth of Heaven and Hell"
IS IT TIME FOR A NEW SYSTEM ON EARTH? 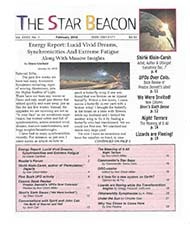 The February 2018 issue also contains classified ads and other intriguing tidbits of information you won't want to miss.